On September 30th in Kimberly, B.C. I presented a poster on behalf of the Friends of Ecological Reserves (FER) at a conference entitled “Solving Wicked Problems: Using Human Dimensions to Inform Natural Resource Management”. The Columbia Mountains Institute of Applied Ecology organized and hosted the two day event, which focussed on the value of considering the human dimensions of issues ranging from the tragedy of the commons and climate change, to reducing conflicts between people and wildlife. Many of these complicated problems continue, not because of a lack of technical or natural science information, but because of human behaviour. Social sciences and the humanities can help natural resource managers better understand and influence the human behaviours that contribute to these multi-faceted quandaries. The FER poster summarized key points from the article that appeared in the Autumn/Winter 2013 of the LOG called “Failing to Plan or Planning to Fail…” which I co-authored with Mike Fenger. The poster attracted a great deal of interest during the social and poster session on September 30, which was attended by 55 people. Many at this conference had participated in the Commission on Resources and the Environment (CORE), a strategic land use planning process begun in the 1990s and agreed that it was time to update existing land use plans to take into account climate change and current land use patterns, new scientific information, and the importance of including First Nations knowledge, perspectives and interests to share our common future. Several members of the K’tunaxa First Nation also reviewed the poster and expressed interest in the topic of land use and natural resource planning. The majority of the conference participants had not heard of the Friends of Ecological Reserves so the poster session also provided a good opportunity to tell them about the group’s mission and activities. There was more awareness of the existence of ecological reserves in the Kootenays, and several individuals had visited at least one of the seven ERs in that area. Interested attendees took all of the issues of the LOG newsletter that I brought to the conference. Mike Fenger, Louise Beinhauer and I developed the “Failing to Plan or Planning to Fail” poster in September 2014. It can be downloaded from the FER website and printed in a larger format. 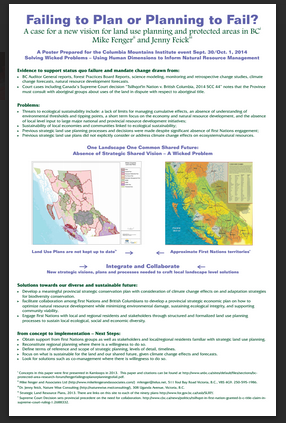 See http://ecoreserves.bc.ca/wp-content/uploads/2014/12/September2014-poster.pdf.